Oppo CHP1879 appeared mysteriously on Oppo's official website. The as-yet-unannounced mystery smartphone recently secured NCC certification in Taiwan, subsequently, it appeared on Geekbench, now we have Exclusively obtained the Press Render and Specifications of the device. The mystery Oppo CPH1879 continues to surface online. We at MySmartPrice have been closely following up on the Oppo smartphone, which now appears to be a capable mid-range Android handset that is packing some high-end specifications and features. According to the recently leaked specifications, the Oppo CPH1879 features a 6.4-inch display. Although the details aren’t mentioned, previously we had discovered the device will have a Full HD+, presumably AMOLED display with 1080 x 2340 resolution. As suspected earlier, the Oppo smartphone does have a teardrop notch at the top that will house the front camera. The newly surfaced details corroborate the fact that the Oppo CPH1879 will have 6GB RAM and 128GB internal storage. The device will run on the Android 8.1 Oreo operating system out of the box at launch. But it is quite likely the handset will have the ColorOS custom skin on top of the base Android version. The mystery Oppo smartphone will have a fingerprint scanner. However, we are not sure if the smartphone will have a standard rear-mounted one or an in-display biometric authenticator. The OPPO CPH1879 made its first appearance online a couple of months back when it received certification from Taiwan’s NCC. The smartphone was subsequently spotted on the official OPPO website for a brief period. 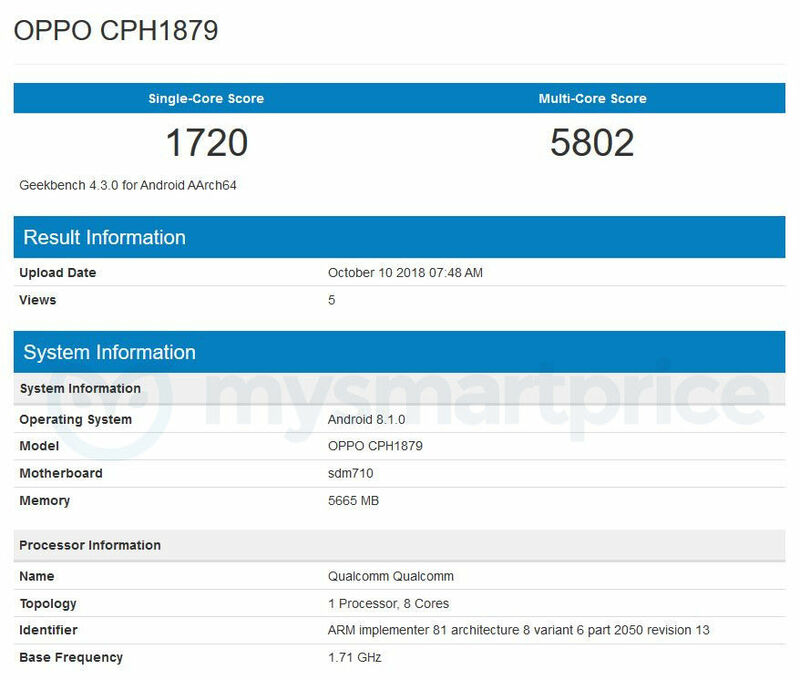 Recently, a device sporting the name Oppo CPH1879 even appeared on Geekbench. All these developments are quite surprising primarily because Oppo is yet to officially acknowledge the existence of the smartphone. 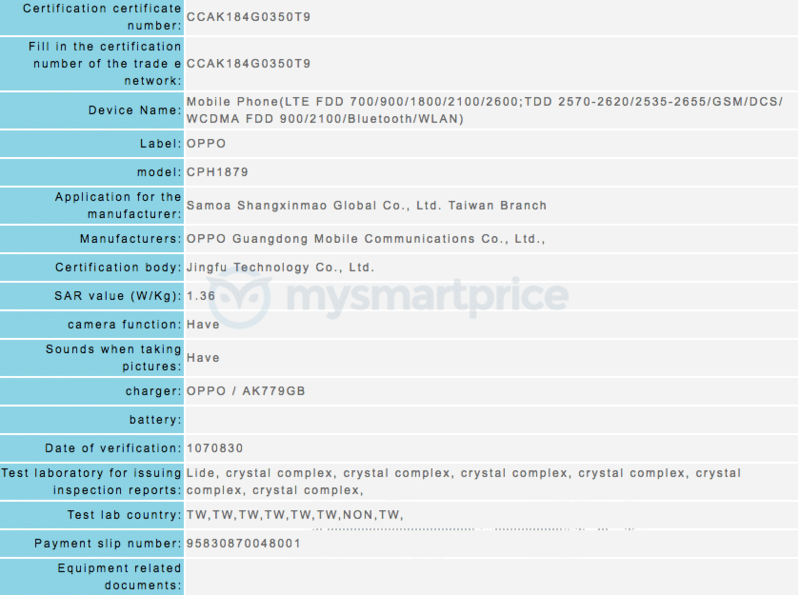 Given the fact it still identifies as Oppo CPH1879, the Chinese company is yet to even name the device. The leaked image and specifications strongly indicate Oppo is readying a premium Android smartphone. The OPPO CPH1879 made its first apperance online a few weeks back when it received certification from the Taiwan’s NCC. More recenrtly, the smartphone was spotted on the official OPPO website. It has now appeared on the Geekbench benchmark database as well. However, the company is yet to even officially acknowledge the existence of the mystery smartphone, and apparently not even christened it yet. Still, we at MySmartPrice have managed to keep track of the mystery Oppo smartphone that could launch soon. Given the limited specifications and reports about the Oppo handset, it appears the company is readying a capable mid-range Android smartphone. After receiving certification from Taiwan’s NCC and making an appearance on the official OPPO website, the unannounced CPH1879 has now popped up on the Geekbench benchmark database. The Geekbench benchmark listing suggests the smartphone will be powered by a Snapdragon 710 and not the 670 as suggested by the official listing on the OPPO website. 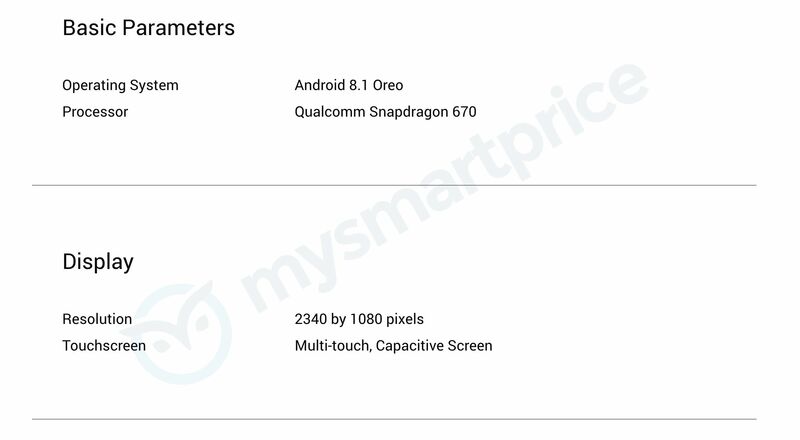 Apart from the chipset powering the device, the Geekbench listing also tells us that the smartphone will feature 6GB of RAM and run on the Android 8.1 Oreo operating system out of the box at launch. In terms of performance, the device managed to score 1,720 points in the single-core test and 5,802 points in the multi-core test. Oppo seems to have hinted about its as yet unannounced mystery smartphone. The handset, codenamed CPH1879, appeared on Oppo’s official website. The latest news about the mystery Oppo CPH1879 smartphone confirms multiple interesting details. 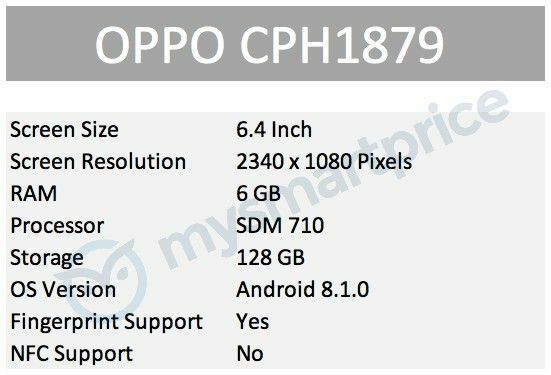 The information that appeared online on none other than Oppo’s own website confirms the display resolution, Android version as well as the processor that will power the CPH1879. According to the information, Oppo CPH1879 will feature a Full HD+ screen with 1080 x 2340 resolution. 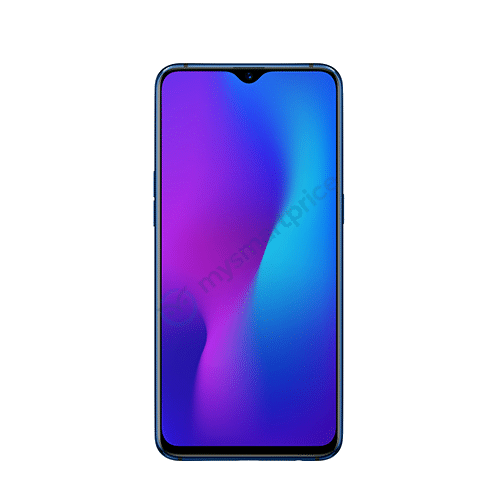 Given the previous releases, this Oppo smartphone may have the water drop display notch that houses the front camera. The screen technology mentions only multi-touch capacitive screen. However, given the other details, the smartphone may have a large AMOLED display. Qualcomm Snapdragon 670, a powerful mid-range octa-core processor, will power the Oppo CPH1879 smartphone. Incidentally, the recently released Oppo R17 Pro has the Snapdragon 710 SoC. Meanwhile, the Oppo F9 Pro has MediaTek Helio P60 processor. The mystery device sits in between these handsets. The processor is a great choice for capable yet affordable Android smartphones. However, not all smartphones have the SoC. There are devices with MediaTek, and even the Kirin processors that can beat the Snapdragon 670 in terms of price and affordability. However, the 670 offers a great balance between performance and battery endurance. The information also indicates the mystery Oppo smartphone will run Android 8.1 Oreo. But it is quite likely the handset will have the ColorOS custom skin on top of the base Android version. The mystery Oppo CPH1879 smartphone is rapidly progressing towards a launch, which might take place in the next few months. The impeding acknowledgement and launch of the smartphone is apparent from the fact that the handset recently passed through and obtained NCC certification in Taiwan. The NCC certification doesn’t contain a lot of information. However, it does indicate the smartphone will offer 4G connectivity, GPS+GLONASS, Bluetooth, and Wi-Fi. It is difficult to pinpoint which Oppo smartphone the CPH1879 succeeds. However, an Oppo smartphone codenamed CPH1837 debuted as the Oppo A3 a few months ago. Hence it is likely the mystery smartphone could belong to the Oppo A-Series. Oppo recently launched an interesting parallel revision of Oppo F9. 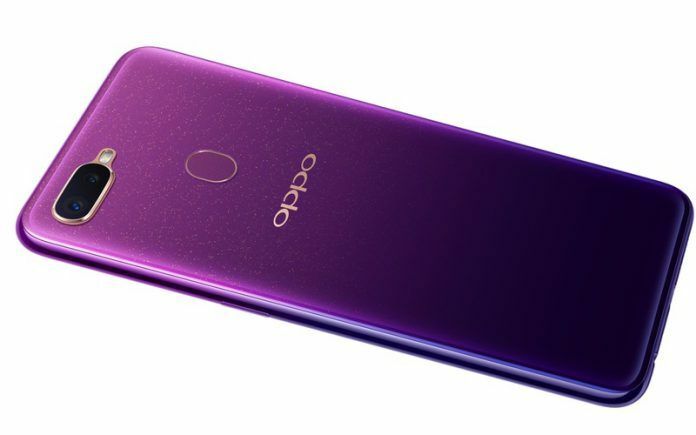 The Oppo A7X appears to be slightly different variant of the Oppo F9. It featured a 6.3-inch IPS LCD display with a water drop notch and a 19.5:9 aspect ratio. The handset has a 90.8 percent screen-to-body ratio. Similar to the Oppo F9, the A7X had 12nm MediaTek Helio P60 octa-core processor clocked at 2.0 GHz, and paired with Mali-G72 MP3 GPU. The smartphone also had 4GB of RAM, but packed double the amount of internal storage. Meanwhile, the Oppo R17 sports a 6.4-inch AMOLED display with a water drop notch, 1080 x 2280 Full HD+ resolution and a 19:9 aspect ratio. A Qualcomm Snapdragon 670 octa-core processor clocked at 2.0 GHz with an Adreno 615 GPU, powers the R17. The handset is available in 6GB/128GB and 8GB/128GB memory configurations. 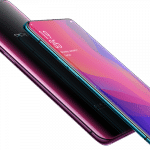 The Oppo R17 Pro packs Qualcomm Snapdragon 710 octa-core processor. The mystery Oppo CPH1879 appears to sit somewhere between these devices. The screen resolution, the processor, and other scare details about specifications hint Oppo could be readying a mid-range Android smartphone with an aggressive price tag.